If you were growing up in New Zealand and Australia post World War II, there’s a chance you knew about the United States using the Marshall Islands as a nuclear testing site from 1947 until 1962. In an agreement signed with the United Nations, the U.S. government held the Marshall Islands as a “trust territory” and detonated nuclear devices in this pristine area of the Pacific Ocean—leading, in some instances, to huge levels of radiation fall-out, health effects, and the permanent displacement of many island people. In all, the U.S. government conducted 105 underwater and atmospheric tests. You would have also known that the British conducted seven atmospheric tests between 1956 and 1963 on traditional Aboriginal land, in Maralinga, Australia. It may be that you read Neville Shute’s 1957 novel On the Beach, in which people in Melbourne, Australia wait for deadly radiation to spread from a Northern Hemisphere nuclear war. This book made a memorable impact on Helen when she read it as a teenager. When I was a teenager, some years later, I read Bertrand Russell’s 1959 classic, Common Sense and Nuclear Warfare. Both Helen and I saw Peter Watkin’s The War Game, a BBC documentary drama about nuclear war and the consequences in an English city. In New Zealand the film was restricted for children unless accompanied by an adult, so I had to get my father to take me. The War Game won the Oscar for the best documentary in 1965. France began its series of over 175 nuclear tests at Mururoa, in the South Pacific, in 1966. At least 140 of these tests were above ground. In 1973, the New Zealand and Australian governments took France to the World Court for continued atmospheric testing, and forced the last tests underground. The testing finally came to an end in 1976. In New Zealand the U.S. Navy made regular visits between 1976 and 1983 with nuclear-powered and, most likely, nuclear-armed, ships. These visits produced spectacular protest fleets in the Auckland and Wellington harbours, when hundreds of New Zealanders—in yachts of all sizes, in motor boats and canoes, even on surf boards—surrounded the vessels and tried to bring them to a complete stop. By 1978, a campaign began in New Zealand to declare borough and city council areas nuclear-free and, by the early 1980s, this symbolic movement had quickly gained momentum, covering more than two-thirds of the New Zealand population. Helen Caldicott and I had not met up to this point, but these were shared parts of our history and consciousness when Helen visited New Zealand in 1983. 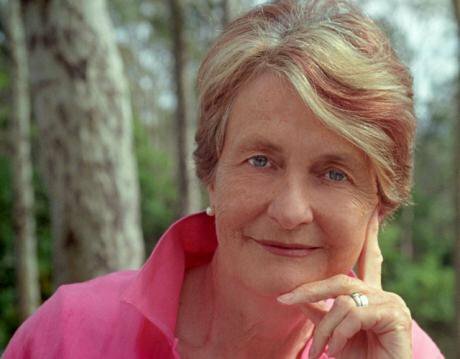 Helen Caldicott graduated with a medical degree from University of Adelaide Medical School in 1961. She moved to the United States, becoming an Instructor in paediatrics at Harvard Medical School and was on the staff of the Children’s Hospital Medical Centre in Boston, Massachusetts. In the late 1970s, Helen became the President of Physicians for Social Responsibility. This group was founded when Helen was finishing medical school, quickly making its mark by documenting the presence of Strontium-90, a highly radioactive waste product of atmospheric nuclear testing, in children’s teeth. The landmark finding eventually led to the Limited Nuclear Test Ban treaty, which ended atmospheric nuclear testing. But it was the Three Mile Island accident that changed Helen’s life. An equipment failure resulted in a loss of cooling water to the core of a reactor at the Three Mile Island Nuclear Generating Station in Pennsylvania, causing a partial meltdown. Operator failure meant that 700,000 gallons of radioactive cooling water ended up in the basement of the reactor building. It was the most serious nuclear accident to that date in the U.S. Helen published Nuclear Madness the same year. In it she wrote: “As a physician, I contend that nuclear technology threatens life on our planet with extinction. If present trends continue, the air we breathe, the food we eat, and the water we drink will soon be contaminated with enough radioactive pollutants to pose a potential health hazard far greater than any plague humanity has ever experienced.” In 1980, Helen resigned from her paid work positions to work full time on the prevention of nuclear war. In 1982, Canadian director Terre Nash filmed a lecture given by Helen Caldicott to a New York state student audience. Nash’s consequent National Film Board of Canada documentary If You Love this Planet was released during the term of U.S. President Ronald Reagan, at the height of Cold War nuclear tensions between the United States and the Soviet Union. The U.S. Department of Justice moved quickly to designate the film “foreign propaganda,” bringing a great deal of attention to the film. It went on to win the 1982 Academy Award for Documentary Short Subject. That same year, Helen addressed about 750,000 people in Central Park, New York in the biggest anti-nuke rally in the United States to that date. In 1983, I was serving as a member of the New Zealand parliament, having been elected eight years earlier at the age of 23. Our parliament established a Disarmament and Arms Control Select Committee to conduct hearings on the possibility of making New Zealand a nuclear-free zone. During this critically important time, Helen was invited to New Zealand on a lecture tour. The documentary If You Love This Planet was shown at her speaking engagements. I did not get to meet her, nor hear any of her lectures in person, as I was working in parliament every night. But I did follow the media coverage. I had sat in a New Zealand parliamentary committee hearing some months earlier, when a government colleague, brandishing a centrefold of a Russian submarine, excitedly called for us to “Look at how big it is.” I had thought that no one would believe me if I had repeated such an inane banality—when an adult male was more impressed by the size of the submarine than its capacity to destroy life on this planet. Helen’s approach was transformative in New Zealand. Helen’s speaking events packed auditoriums, and overflows of audiences had to be accommodated using loud speaker systems. People responded strongly to this woman, whose life work involved caring for children, speaking about medical effects of fallout, and speaking without the use of the clichéd military and defence ideological rhetoric that treated people as if they were simpletons who couldn’t understand. Her speeches inspired people to act. After Helen spoke, the volume of mail delivered to my parliamentary office increased—particularly from women. Shortly after Helen’s visit to New Zealand, in 1984, I advised that I intended to vote for the opposition-sponsored nuclear-free New Zealand legislation. This prompted conservative Prime Minister Rob Muldoon to call a snap election. Muldoon told media that my “feminist anti-nuclear stance” threatened his ability to govern. The new Labour Government of 1984 passed the New Zealand Nuclear Free Zone, Disarmament and Arms Control Act in 1987, the world’s first national nuclear-free legislation. Dr. Helen Caldicott’s influence had culminated in the passage of the cornerstone of New Zealand’s foreign policy. This essay is one of 28 stories by notable women about remarkable women peacemakers brought together in a collection to celebrate the 10th anniversary of the Nobel Women’s Initiative. 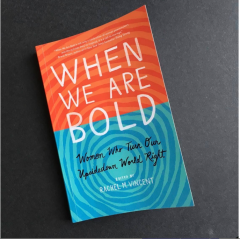 When We Are Bold: Women Who Turn Our Upsidedown World Right! Editor, Rachel Vincent, September 27, Mapalé.